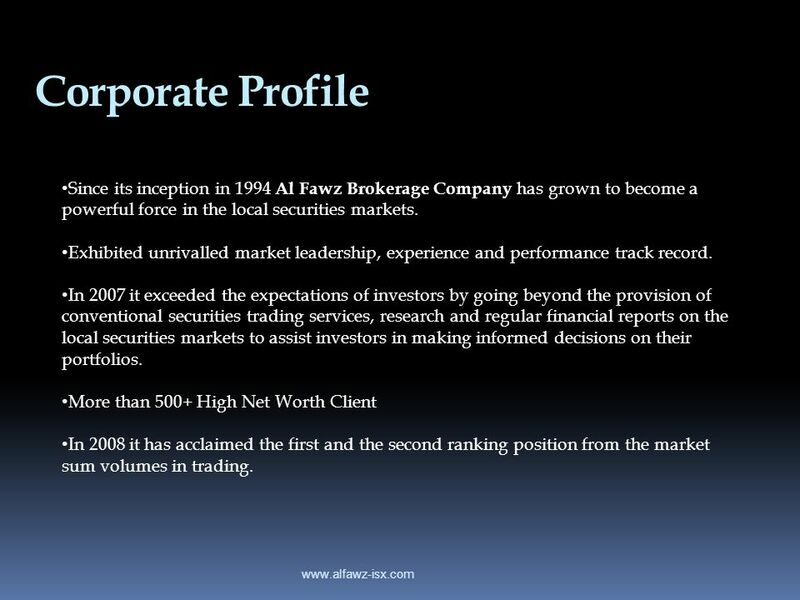 2 Corporate Profile Since its inception in 1994 Al Fawz Brokerage Company has grown to become a powerful force in the local securities markets. Exhibited unrivalled market leadership, experience and performance track record. In 2007 it exceeded the expectations of investors by going beyond the provision of conventional securities trading services, research and regular financial reports on the local securities markets to assist investors in making informed decisions on their portfolios. More than 500+ High Net Worth Client In 2008 it has acclaimed the first and the second ranking position from the market sum volumes in trading. 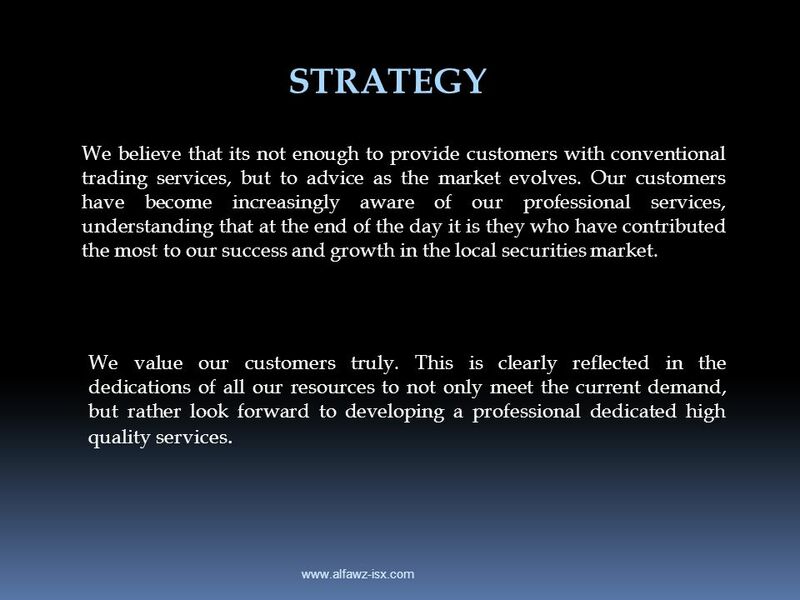 3 STRATEGY We believe that its not enough to provide customers with conventional trading services, but to advice as the market evolves. 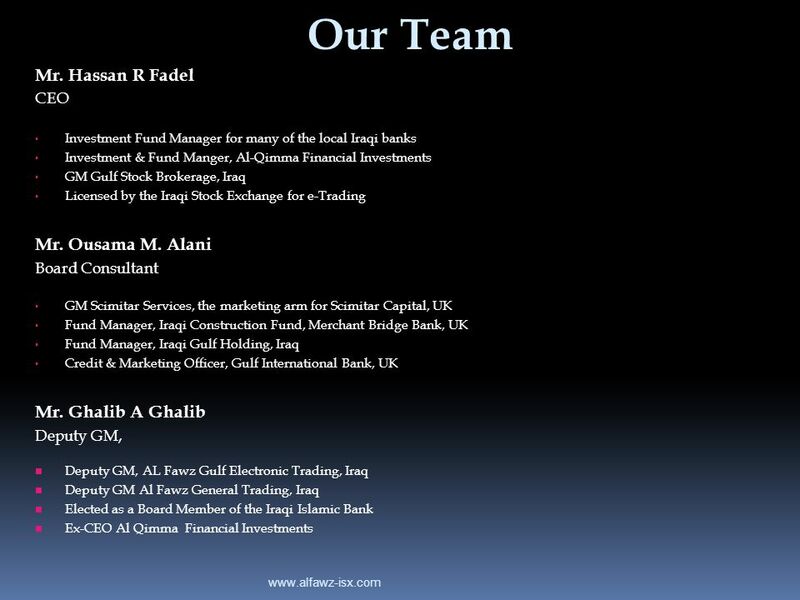 Our customers have become increasingly aware of our professional services, understanding that at the end of the day it is they who have contributed the most to our success and growth in the local securities market. We value our customers truly. This is clearly reflected in the dedications of all our resources to not only meet the current demand, but rather look forward to developing a professional dedicated high quality services. 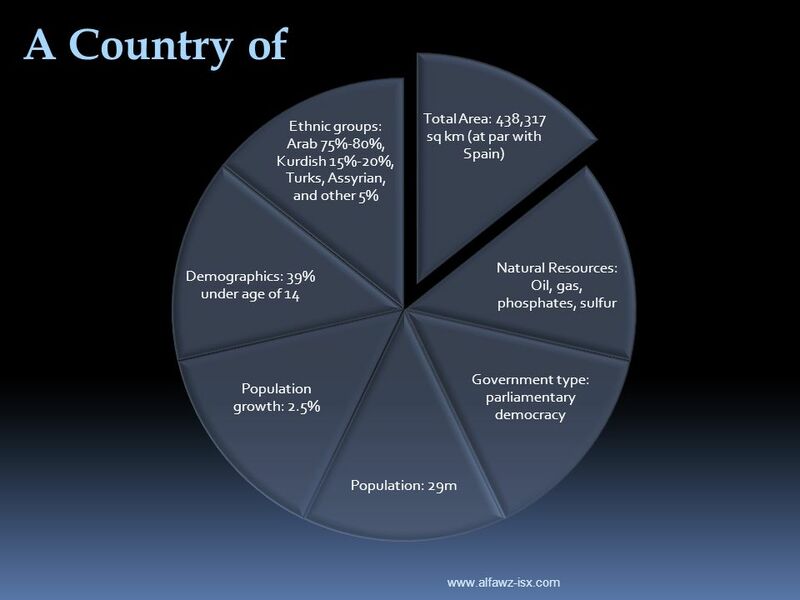 5 Foreigners can own 100% of Iraqi companies, must pay only a 15% flat tax on profits, and may take 100% of those profits home when and how they please. 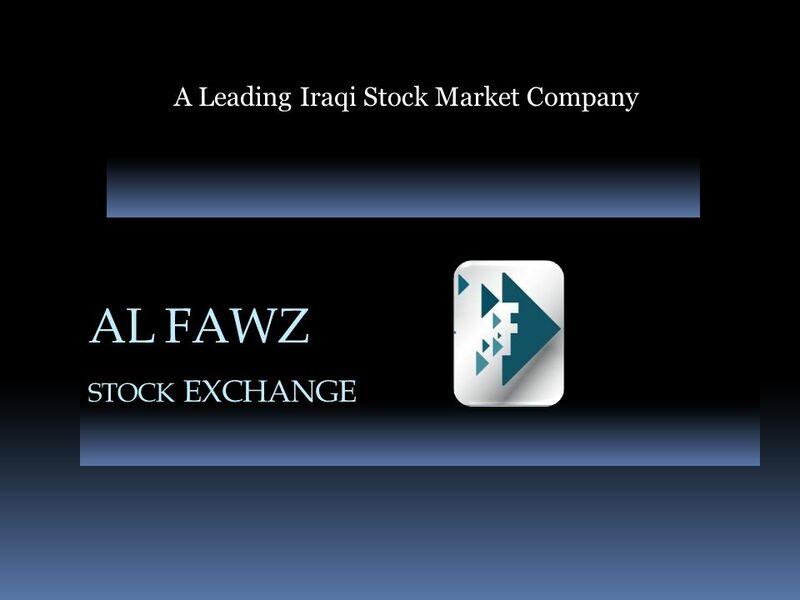 The Market Emerging from devastating years of war, sanctions, and a state bureaucracy, Iraq presents a new and unique opportunity for Investors. 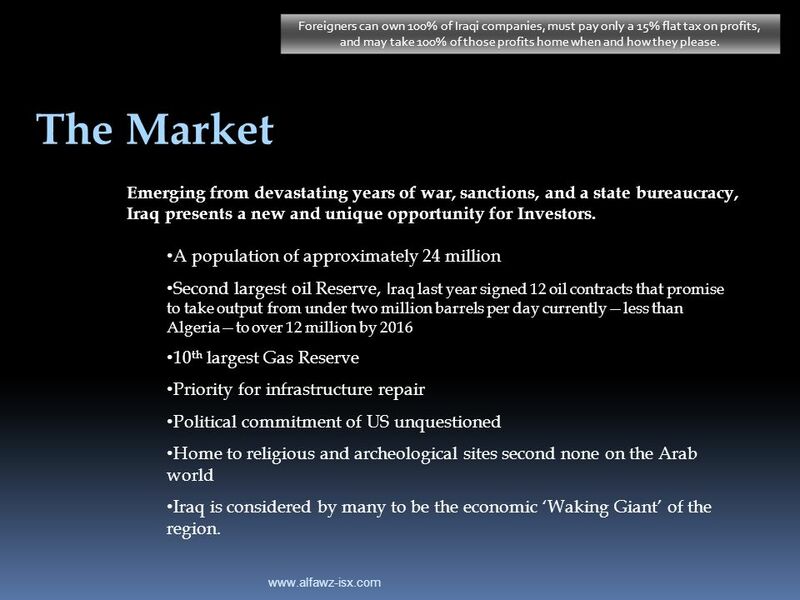 A population of approximately 24 million Second largest oil Reserve, Iraq last year signed 12 oil contracts that promise to take output from under two million barrels per day currently—less than Algeria—to over 12 million by 2016 10th largest Gas Reserve Priority for infrastructure repair Political commitment of US unquestioned Home to religious and archeological sites second none on the Arab world Iraq is considered by many to be the economic ‘Waking Giant’ of the region. 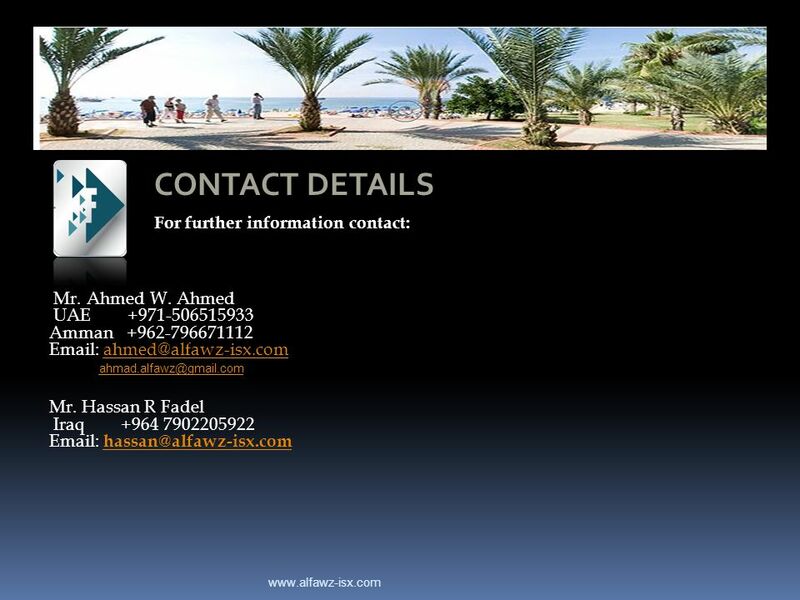 Download ppt "A Leading Iraqi Stock Market Company"
Wolverhampton. Making it happen High Value Manufacturing (HVM) Supply Chain Clustering ‘Bangalore to the Black Country’ what you can achieve Jay Patel. Presented by: Carlene Messam First Vice President, SunTrust Bank Telling Your Story Not-For-Profit – Credit Profile Assessment. 1 The Experience of Private Hospitals In the Republic of Yemen Success and Problems Dr. Ali K. Abbas Yemen International Health & Education Consultants. 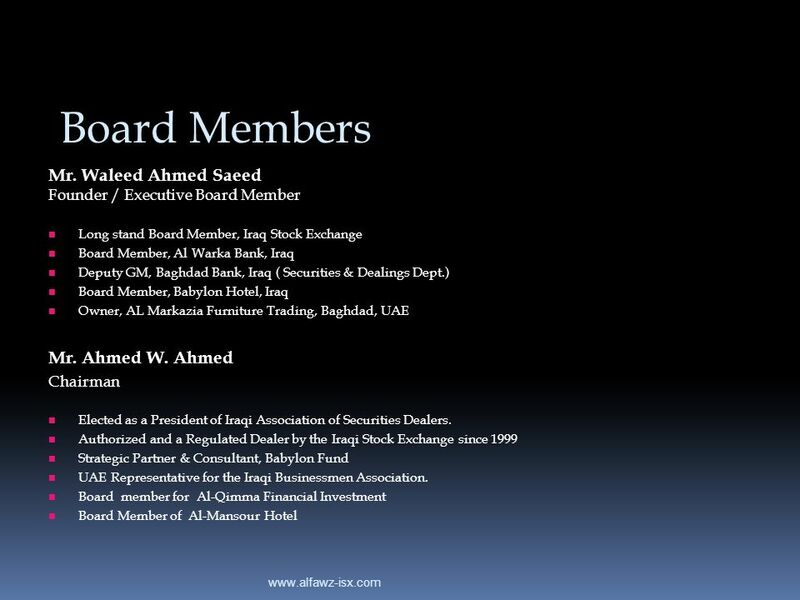 Panel 2: The Road Ahead for Omani Banking 13 April 2008. State Employees Union. State Employees Union is part of the General Federation of Labor in Israel – “Histadrut” It represents all the civil servants In. VED S.A.. VED Your trusted partner for Investment Management, Mergers & Acquisitions and Real Estate Investments VED S.A. 1.